This entry was posted on June 22, 2017 by Jessica Anderson. Do you have special plans to celebrate Independence Day? Perhaps you are planning a 4th of July parade, BBQ, or cooking contest? Or maybe you are hosting a fireworks display and picnic? Add extra hype to your event with one of our 4th of July Awards! See ideas below to take your event to the next level. These patriotic trophies are the perfect symbol for Independence Day! 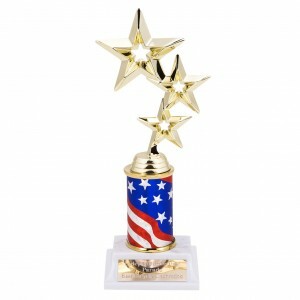 We offer a large selection of 4th of July themed trophies for your celebration. These include flag trophies, acrylic awards, and even fireworks medals! 4th of July Parade: If your parade has a competition between floats, bands, or other community groups, be sure to award trophies to the winners. Popular awards include larger trophies with posts, such as our Rising Star Competition Trophies. In two styles, these grand trophies feature star trim and can be made with red column, blue column, or stars and stripes flag column. Barbecue Cook Off: Attending a cookout? Bring the host a one-of-a-kind BBQ trophy or engraved cutting board. Or consider hosting your own BBQ cooking competition! Have your contestants bring their favorite meat to grill and judge the winners. Check out our large selection of BBQ trophies here. Cooking Contests: The 4th of July is the classic time for hot dog and pie eating contests. If you host a food contest, award your winners one of our cooking trophies. 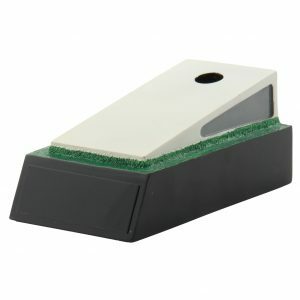 Or make your own custom trophy, especially for your event with one of our sublimated awards. Corn Hole is a fun 4th of July game for all ages! Backyard Games: The holiday weekend is the perfect time to get outside and enjoy family time. Backyard games, such as horseshoes, bocce balls, ladder ball, corn hole toss, and pickle ball bring the family together with good, wholesome, All-American fun! Award trophies to your winners - see all of our selection in our Backyard Games section. For other ideas for decorations, costumes, parades, and more, check out our 4th of July Pinterest Page! No matter how you choose to spend the July 4th holiday, it's great to be an American! Wishing you a happy and healthy Independence Day celebration with family, friends and neighbors. Editor's Note: This post was originally published on June 23, 2015. It has been updated for content.